The Black Russian Terrier was created as a guard dog by the Red Star Kennel in Russia. The aim of the Russian Army was to create a large universal military dog that would be sturdy, hardy, and strong. 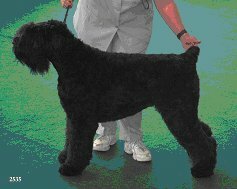 The breeds used were primarily Giant Schnauzer, Airedale Terrier, Rottweiler, and Newfoundland. Other breeds included Great Dane, Eastern European Shepherd, and Caucasian Shepherd. Some 17 breeds in all were used. By the 1970s the foundation dogs of what were to become Black Russian Terriers were established. In 1981 the first breed standard was accepted by the USSR Ministry of Agriculture. In 1984 at the International Assembly in Mexico the BRT was recognized by the Fédération Cynologique Internationale. BRTs came into the US between 1989 and 1990. In 2001, the Black Russian Terrier was admitted into the Miscellaneous Class of the AKC. On July 1, 2004, Black Russian Terriers were granted full acceptance into AKC as members of the Working Group in conformation events. BRTs are not for everyone. The BRT is not known to have an especially dominant nature, but they are stubborn and very intelligent. Experienced owners are preferred. They are somewhat aloof with strangers and, unless socialized early, will not tolerate handling by anyone outside the family. The BRT is considered brave, self-confident, and reliable; they are not shy. They are slow to mature and need constant human contact. They do not do well in kennels or kept outside in yards or garages. Because the BRT was created as a guard and protection dog, care should be taken to train it responsibly. The BRT was created to work in partnership with its owner. The BRT is a thinking dog. It responds to logic more than force. Therefore positive reinforcement is more productive than harsh corrections. At a minimum the BRT needs a puppy kindergarten for socialization and a basic obedience class. Socialization in all types of daily activity is necessary for the BRT. An owner should take the BRT puppy at least three new places every week for the first six months of its life and expose it to every type of person and situation the adult BRT will ever experience in its lifetime. This should include people in uniform and people of all ages and nationalities. BRTs need intense socialization as puppies and continuous training throughout their lives. BRTs can not be left in a kennel or backyard. They need the contact and companionship of a family. BRTs need to be brushed weekly and professionally groomed every six weeks. They shed more than an Airedale but less than a Golden Retriever or Labrador. BRTs have competed in a wide range of activities from obedience to protection work and tracking. For its emotional health, a BRT needs your love, respect, and the companionship of you and your family. - lacks knowledge about Black Russian Terriers. - shows ignorance of, or who denies, genetic defects in the breed. - does not allow you to observe the puppies or parents, or does not allow you to see the kennels. - cannot provide you with litter documentation or a pedigree. - wants to sell you an unregistered puppy. Do not buy a puppy that is not socialized or acts shy or fearful. Do not buy a puppy less than 8 weeks old. Overall: A robust, large, and powerful dog with large bone and well-developed muscles. They are calm, confident, and courageous. Color: Black with a few white or gray hairs. Weight: 80 to 140 lbs. Coat: The outer hairs are rough and thick, with a softer undercoat. BRTs love their people. I have four shadows always willing to help with housework. All in all a delightful mix of breed characteristics. As a first-time owner, I am amazed at their intelligence and look forward to the challenge of staying just one step ahead of this beautiful breed. BRTs like to be your friend and constant companion, but you should consider ownership carefully before you buy.